Asian markets rose on the heels of Wall Street's overnight gains on the back of robust earnings reports in the United States. 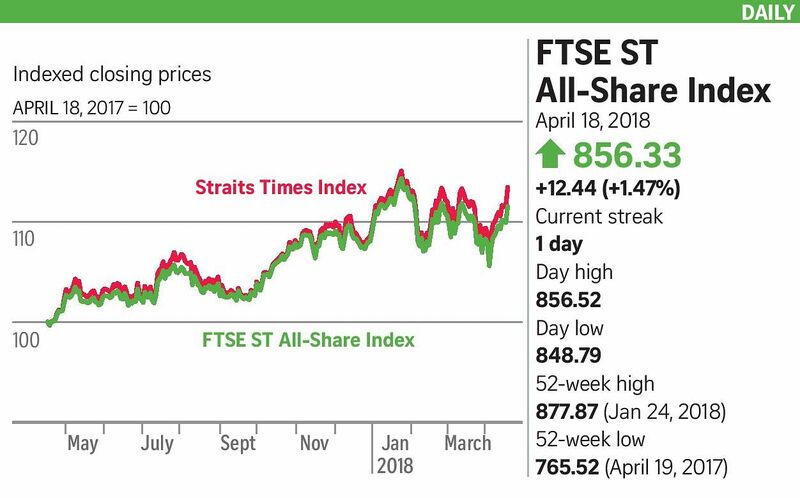 The key Straits Times Index added 59.62 points, or 1.7 per cent, to close at 3,557.82. About 2.2 billion shares worth $1.5 billion were traded, with gainers outpacing losers 233 to 193. IG market strategist Pan Jingyi described the sentiment on Wall Street as being "generally positive", with "risk sentiment contained and earnings driving optimism within the equity market". The gains here were mostly by the three local banks, whose shares have been on a week-long uptrend. Investment banking firm Jefferies reiterated its "buy" call on DBS, OCBC and United Overseas Bank yesterday, believing that the policy shift by the central bank last week suggested a reflationary outlook that augurs well for banks. Index constituent Singapore Press Holdings also rose, advancing 11 cents or 4.2 per cent to $2.71 after announcing a tie-up with Google Home. Users of the voice-enabled smart speaker can listen to news and podcasts from some of its newspapers and radio stations. Ground-handling provider Sats rose 18 cents, or 3.4 per cent, to $5.45, possibly linked to a Bloomberg report last week that said Singapore investment firm Temasek is studying potential investments in Swissport Group and Gategroup Holding, both owned by HNA, as it considers deals with the indebted Chinese conglomerate. Swissport offers ground and cargo handling services at airports, while Gategroup is an airline caterer. "The street may be extrapolating something from there," an analyst said. Sats is two-fifths owned by Temasek. A Reuters report on Tuesday said Temasek is also interested in buying into HNA's Hong Kong-based carriers, Hong Kong Airlines and Hong Kong Express Airways. Stocks that bucked the rising trend here included Creative Technology, down 19 cents to $5.72, and Best World International, which lost eight cents to $1.59. Ezion Holdings also continued its slide, shedding another 1.7 cents, or 8.8 per cent, to 17.7 cents after the resumption of trading on Tuesday. One to watch on the local bourse is Datapulse Technology as a six-month-long bitter shareholder feud comes to a head at tomorrow's extraordinary general meeting. This will see one board pit itself against four proposed directors. Shareholders will also vote on the fate of the company's controversial diversification plan.